This weeks Torah portion is called Massei, which means Journeys. It's the final parsha in the Book of Numbers, the fourth book of the Torah, whose Hebrew name is Bamidbar, meaning, In the Dessert. And the parsha begins by saying, "These are the journeys of the children of Israel who left the land of Egypt in their legions, under the charge of Moses and Aaron" (Numbers 33:1). And much of the portion is devoted to a summary of their journey, from the liberation from slavery and exodus from Egypt, through the long years of traveling through the Sinai dessert, to the east bank of the Jordan River, on the border of the Promised Land. This is where the journey ends for Moses, and this is where the journey ends in the Torah. The next and last book, the Book of Deuteronomy, relates the final words of Moses to the Israelites, and end with the passing of the greatest of our prophets, which occurs before the Israelites cross over into the Promised Land. It is not until the sixth book of our Holy Scriptures, the Book of Joshua, that the Israelites actually enter and take possession of the land, which is where we find the famous story of how the blowing of the shofars brought down the walls of the city of Jericho. But this week's parsha looks ahead to the return of the Israelites to Canaan, and speaks of how the Promised Land should be divided up, detailing the different areas that will be given to each of the twelve tribes, and what their boundaries will be. And it lists the names of the chieftains of each of the twelve tribes, along with Joshua as the successor to Moses, and Eleazar the priest as the successor to Aaron. In last week's D'var Torah, I talked about the tribal roots of the Jewish people, and how the Torah and Tanach tell the story of the difficult transition from tribalism to civilization. And I talked about how the Semitic aleph-bet and literacy was central to this transition, in establishing the Torah as a sacred text, in providing the first written history to take the place of myth and legend, and in providing the first true system of codified law, ethics, and human rights. Parsha Massei concludes with two examples of this transition, in both cases providing progressive responses to tribal realities. One of them follows up on an earlier passage in the Book of Numbers (27: 1-11) that tells the story of how Zelophehad, of the tribe of Manasseh, died leaving behind five daughters, but no sons. His daughters argued that, in the absence of a male heir, they should have the right to inherit their father's property. They made their case before Moses, the high priest Eleazar, the twelve chieftains, and the entire assembly gathered in the Tent of Meeting. And God tells Moses that their plea is just, and establishes a new ruling that daughters can inherit property when there are no sons. It was a small step for women's rights, but it was progress, without a doubt. And it also demonstrated a willingness to break from established tribal traditions, to replace adherence to longstanding customs with a legal system where cases can be decided on rational grounds, and traditions can be reviewed objectively, criticized, and modified, or even abandoned. In this way, Moses establishes a new, general rule, based on this one specific case, moving from the concrete to the abstract. As for the daughters of Zelophehad, they found this to be a perfectly acceptable resolution. In all likelihood, they would have married members of their own tribe anyway. The other example of the transition from tribalism to civilization in Parsha Massei is God's directive that the children of Israel establish six cities of refuge in the Promised Land. And it is important to recall that at this time, there are no police officers, no criminal justice system, no courts as we understand them. It was accepted as common sense that, if one person kills another, then relatives of the victim are justified in seeking vengeance. Therefore, the killer may be pursued by what the Torah refers to as a blood avenger. This is what the Italians refer to as a vendetta, a word that was adopted in the English language in the 19th century. A vendetta can refer to the single act of vengeance, but also to the blood feud that ensues when one act of vengeance is followed by another act of retaliation in a series of exchanges that can go on indefinitely, and may escalate in intensity. In the United States, the most famous example of this is the 19th century feud between the Hatfields and the McCoys in West Virginia and Kentucky, following the Civil War. In an attempt to avoid this kind of destructive behavior, the Torah establishes a clear distinction between killing someone intentionally and killing someone by accident, the distinction that today we refer to as the difference between murder and manslaughter. If the victim was killed intentionally, or otherwise out of malice, the Torah says that the blood avenger is permitted to kill the murderer. If the avenger is not a firsthand witness to the murder, he can still exact his vengeance based on the testimony of witnesses, and the use of the plural here is significant, because the Torah also insists that, "a single witness may not testify against a person so that he should die" (Numbers 35:30). This does not meet contemporary standards, of course, but for its time, it is progressive in establishing that there is a burden of proof that must be met before someone is condemned as a murderer. But the same portion also insists that a murderer's life cannot be ransomed, that the murderer cannot buy his way out of the death penalty, a harsh rule, but one that insures equality before the law, for rich and poor alike. A blood avenger does not necessarily distinguish between murder and manslaughter, and it is understood that acts of vengeance are driven by emotion. And following the old traditions of tribal life, a blood avenger may still pursue someone who has killed someone unintentionally, perhaps not believing it was an accident, or maybe not caring about the killer's motivation. We recognize today that manslaughter is in fact a crime, that someone who is guilty of manslaughter may be innocent of murder, but is not entirely innocent altogether. Likewise, in our tribal tradition, the blood avenger is still permitted to seek vengeance. But the killer can flee to one of the six cities of refuge, and ask for asylum. It is then up to the community to judge between the blood avenger and the killer, and if they decide that the death was accidental, then the culprit can be granted sanctuary within the city of refuge. If he steps outside of the city limits, the blood avenger is permitted to exact his vengeance, but as long as he stays inside of the city, he is safe. This amounts to a form of exile and imprisonment, although it is not necessarily a life sentence, as the Torah stipulates that after the High Priest dies, killers guilty of manslaughter are free to leave and return home, and acts of revenge are against them are no longer permitted. We therefore have a new set of laws that break with tradition, and are therefore progressive. They are a new set of laws that establish a clear concept of justice, tempered by mercy. And they are laws that are conveyed as general rules, based on abstract principles, the product of a new kind of mindset based on literacy, as opposed to nonliterate traditions where judgment is based on aphorisms, parables and other types of storytelling. By way of contrast, rather than using abstract codes of law, traditional, tribal cultures would refer to a story like the account in Genesis of Cain and Abel, and ask, whether or not the killer in question is guilty of the same kind of act as Cain was. This is akin to arguing a case based on precedent, a type of legal argument that is used here in the United States, and in other nations that use a common law legal system. Legal systems based on civil law are more prevalent worldwide however, and in such systems only the written law, the abstract rule, is considered, and not the concrete examples of previous cases and judgements. Civil law is also known as Continental European Law, while our system of common law is based on the British system. And while it allows for the use of precedent, the cases are still tried based on an established written code consisting of general rules, that is, codified law. What is striking about this is the way that the Torah breaks away from tribalism, in refusing to glorify violence. Tribal societies often view violence as a routine part of life, as natural and necessary, if not cause for celebration. It is not uncommon to find tribal societies glorifying warfare, physical combat, and hunting. Puberty rites for young males typically involved some form of physical violence, and taking part in fighting and killing had a strong association with masculinity. But the written law delivered to the Israelite tribes commanded them that the spilling of blood was abhorrent, especially in the ritual of human sacrifice practiced by many other tribes in the region. The practice of child sacrifice in particular, and human sacrifice in general, is condemned in the strongest possible terms in our Torah and Holy Scriptures. There is a difference, of course, between not glorifying violence, and practicing nonviolence. The Torah does not tell us to be pacifists, and recognizes that there are times when violence is necessary, to stand up for our rights, and to protect each other. In the say way, the Torah tells us that vengeance is wrong, but this does not mean that the heinous crimes can be or ought to be forgiven. Rather, the call is for justice, tempered with mercy, but justice as a rational evaluation based on rule by law, rather than emotional acts of vendetta. And the justice of the ancient world may seem quite harsh to our contemporary sensibilities, but it was a concept of justice that could be modified over time, changing to meet changing circumstances. Over time, we would adopt a new kind of rite of passage for young males coming age, one that replaced violent activity with a literacy test. I'm referring of course to the b'nai mitzvah. With the story of the binding of Isaac, the practice of human sacrifice was replaced by animal sacrifice, and with the destruction of the Temple in Jerusalem, we replaced animal sacrifice with prayer. And in possession of the sacred text of the Torah, we embraced study as a way of life. And especially in exile, living as strangers in strange lands, nonviolence was often the only option. This is not to say that we never fought back in the face of the many forms of tribalism we encountered, but it certainly was not easy being an oppressed and persecuted minority. Antisemitic stereotypes attributed a soft, flabby, and sedentary lifestyle to the bookish Jew in contrast to the masculine, muscular Aryan. Observers in 1933 witnessed the book-burnings of works by Jews and other "decadent" authors, along with the elimination of the same works from libraries and bookshops. The elimination of Jewish books served as a prelude to measures in the next decade aimed at eliminating the Jews themselves. The bookish stereotype has been dispelled, to large degree, through the founding of the State of Israel in 1948, and the fact that the Jewish state was able to defend itself, to resist the combined armed forces of several Arab nations, and to organize the Israeli Defense Forces as one of the most effective military units in the world. But in taking on the task of building our own modern nation-state, and defending it, we find ourselves once again wrestling with tribalism, both externally and internally. How are we to seek justice, and not give in to the desire for vengeance? How are we to temper the desire for justice with a sense of mercy? How are we to stand up for ourselves without glorifying violence? And how are we to defend ourselves without causing harm to others who are innocent of any wrongdoing? The answers do not come easy, but they will never come at all if we do not begin by posing the questions. The Lord spoke to Moses in the plains of Moab by the Jordan at Jericho, saying: Speak to the children of Israel and say to them: When you cross the Jordan into the land of Canaan, you shall drive out all the inhabitants of the land from before you, destroy all their temples, destroy their molten idols, and demolish their high places. You shall clear out the Land and settle in it, for I have given you the Land to occupy it. (Numbers 33: 50-53). But if you do not drive out the inhabitants of the Land from before you, then those whom you leave over will be as spikes in your eyes and thorns in your sides, and they will harass you in the land in which you settle. And it will be that what I had intended to do to them, I will do to you. (Numbers 33: 55-56). Jews all over the world are taking note of these verses in light of the violence and bloodshed in Israel, Gaza, and the West Bank today. And I think we have to understand that in the long journey we have taken from tribalism to civilization, we could no longer follow such a course of action. Over the course of that journey, we have come to be guided by the great sage Hillel, whose most memorable saying can be translated as, do not do to others what you would not have them do to you, or as that which is hateful to you, do not do to others. And no one is claiming that the Jewish people or the State of Israel is perfect, but civilization is not about achieving some form of utopia, it's about establishing a way of life that is not built on violence or vengeance, but on justice and mercy. Tribes cling to a way of life, and refuse to change. Anthropologists tell the story of the People of the Deer, a small Inuit tribe in the Arctic region of Canada. As their name implies, the People of the Deer survived by hunting caribou. Every year, the herds would migrate through the tribe's territory, and the tribe would hunt them, and obtain enough meat to survive through the winter. This was their way of life from time immemorial. But one year the unthinkable happened. The herds were small, and the tribe did not get enough meat to last through the winter. This story is often told to introductory anthropology classes, and the question is then put to students: What do you think the tribe did at this point? The typical answers that were given included moving to another location, trying to follow the herd after they left the territory, rationing out the supplies, sending the old people off to die or killing or exiling some members of the tribe through some other means of selection, and even trying to signal or search for some form of outside help. The one thing that almost no one ever thinks of is the one thing that the tribe did do. Which is nothing. They did nothing, because they could not conceive of doing things in any way differently from the way that they have always done things. And so, they died. The lesson can be taken in different ways. For anthropology students, it brings home the fact of our cultural bias as westerners, that whenever a problem appears, we believe that some sort of action has to be taken. Indeed, we demand that someone do something about it. But sometimes there are no solutions, and all we can do is wait. And in regard to the situation in the Middle East, demands that Israel act unilaterally to resolve the situation may indeed be unrealistic. But we also know, as people who have made the journey from tribalism to civilization, that things can change, that progress is possible. Just as we have made progress from slavery in Egypt to revelation at Sinai to the return to the Promised Land, just as we have made progress from agriculture to industry to electricity and digital technologies, just as we have made progress from archaic custom to rule by law, freedom, equality, and increasing understanding of human rights, so can we make progress from violence to thoughtfulness, from war to peace, from hostility to friendship. The story of the Jewish people, and the story of the Arab people, begins in the Book of Genesis, when God says to Abraham, "Go forth from your native land and from your father's house to the land that I will show you" (Genesis 12:1). And so, our history begins with a journey, a journey made out of faith, without knowing the final destination, and without knowing the way. Jews and Arabs, both the children of Abraham will have to follow the example of our patriarch, if we are ever going to make progress, if we are ever going to leave behind the tribalism of our father's house, if we are ever going to arrive at the Promised Land of a permanent and pervasive civilization where, in the words of the prophet Micah, "each one will sit under his vine and under his fig tree, and none shall make them afraid" (4:4). May it be so, in our time, and soon. And truly, we can't say it enough, No More War! Another op-ed piece written by Adas Emuno president Lance Strate was published in the June 20th issue of the Jewish Standard, entitled, Superhero Spring, and subtitled "Examing the midrash of popular cinematic culture." (For the previous opinion piece, see our post from last month, Jewish Stereotypes on TV). Much has previously been said on the Jewish connection to the comics medium and the superhero genre, given that many of the early comics creators were in fact Jewish. In particular, much has been written about Superman, who was created by two Jewish teenagers in Cleveland circa 1938, and also more generally about the Golden Age of comics that followed. Much less has been said about the Silver Age associated with the 60s, and about Marvel Comics which started early in that decade. The second quarter of 2014 has been rather remarkable for superhero movies, with three different films, Captain America: The Winter Soldier, The Amazing Spider-Man 2, and X-Men: Days of Future Past, in the theaters all at the same time at one point. At this point, it makes sense to include the trailers for the three films, so that even if you haven't seen them, you can at least get a sense of what is being referring to. All three movies are adaptations of Marvel Comics, the publishing group launched by Stan Lee (aka Stanley Lieber) in 1961, and purchased by Disney in 2009. Stan Lee was the son of Jewish immigrants from Romania, and as a teenager took a job in 1939 with Timely Publications, the company that he eventually would evolve into Marvel Comics. The Marvel Age, as it came to be known, was in many ways the result of a collaboration between Lee, as writer and editor, and the artist Jack Kirby. Kirby (aka Jacob Kurtzberg), the son of Jewish immigrants from Austria, started to work as a comics artist in 1936, and was hired by Timely in 1940, while he was still in his early 20s. He worked with Joe Simon, just a few years his senior and also the son of Jewish immigrants, and the two created the most famous of patriotically-themed superheroes, Captain America. Fighting Nazis months before the United States entered the Second World War, this hero stood as a counter to Nazi theories of racial superiority, as the product of good old American know-how. Captain America originally was a frail and weak young man, unfit for military duty, until he was given an experimental serum that transformed him into a super soldier. In a reflection of the egalitarianism of American culture, anyone receiving the same treatment could reach the height of human perfection just as he had. But the secret formula died with the scientist who created it—who was assassinated by a Nazi spy. At first glance Captain America comes across as an all-American hero, but his story in fact encapsulates the intergenerational experience of immigrants and their children. Growing up in Europe under difficult conditions, immigrants tended to be relatively small of stature, sometimes sickly, while their children, born and raised in the United States, grew up tall and strong due to superior diet and medical care. 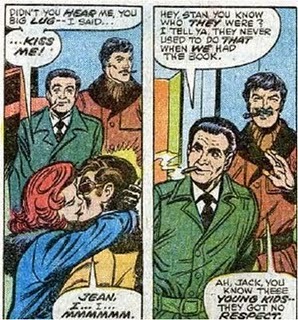 The powerful resonance of this hero, resurrected by Lee and Kirby a few years into the Marvel Age, continued despite the counterculture movement (Peter Fonda’s character in the 1969 film “Easy Rider” was nicknamed Captain America), and is still present in the sequel to the first Captain America film, in which Scarlett Johansson reprises her role as the superspy Black Widow. “Captain America: The Winter Soldier” continues to remind us of the moral clarity of the American fight against Nazism (in the films largely represented by the fictional organization Hydra), as well as the ideal of the American dream, which tells us that we can improve upon and remake ourselves through our own ingenuity. The insight about Captain America is not altogether original, in that, for decades now, the character of Superman has been understood to be the ultimate immigrant, but the discussion of Captain America's immigrant connection is a new one. 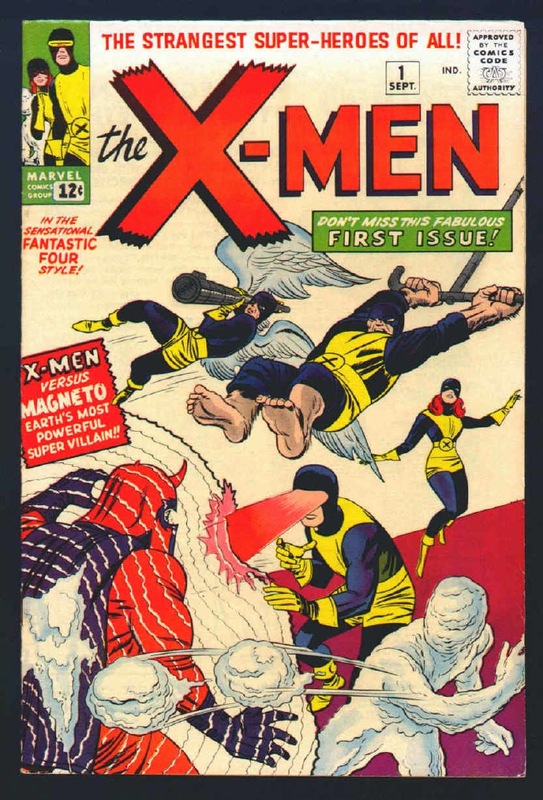 Lee and Kirby also created the X-Men, a superhero team composed of mutants, born with genetic differences that resulted in extraordinary powers and abilities. While originally framed as stories about good mutants battling evil mutants, the concept naturally lent itself to stories about prejudice, drawing upon themes derived from the history of anti-Semitism and the Holocaust and the civil rights movement. Magneto, one of the X-Men’s main antagonists, espoused a variation on Nazi racial theories, arguing that mutants constitute a new species, which he dubbed homo superior. 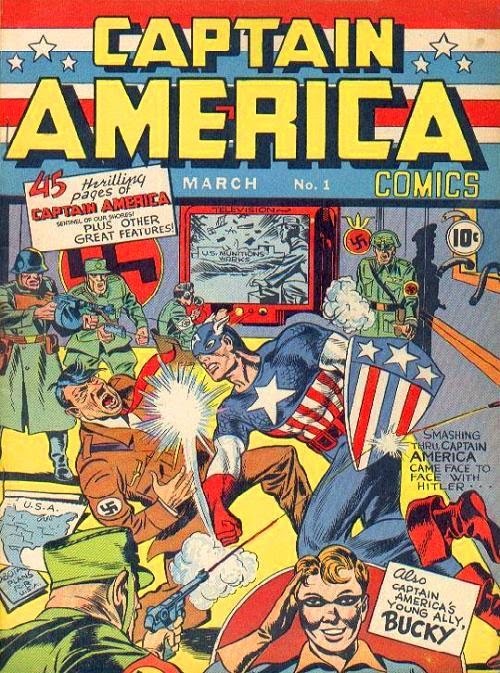 Lee and Kirby never intended for the character to be seen as Jewish, although as the back story evolved he was shown to have been a victim of the Nazis, who after all persecuted a number of other minority groups. Decades after the character was introduced, however, he was transformed into a Jewish-Holocaust-survivor-turned-terrorist through a bit of revisionist comic book history, something of a Malcolm X and Meir Kahane for mutants. 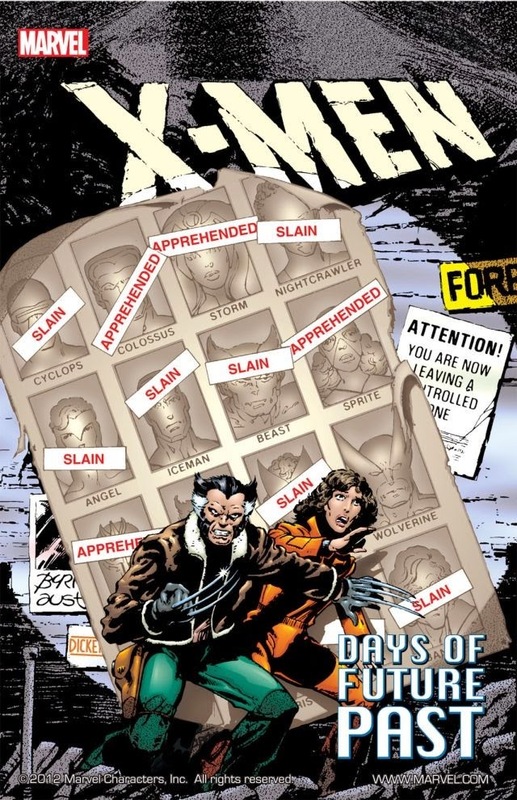 In the comics, this depiction is balanced by the presence of other, entirely positive Jewish heroes, such as the young mutant Kitty Pryde, who plays a significant role in “X-Men: Days of Future Past,” but is never identified in regard to religion or ethnicity. That balance is entirely missing in the 2011 film, X-Men: First Class, which shows Magneto’s childhood experiences in a Nazi concentration camp. While this serves to explain his militancy, the transformation from victim to villain cannot be entirely justified, and the characterization would seem to reflect changing attitudes toward Israel and Zionism in recent years. Thankfully, this year’s X-Men film (the seventh in that series) avoids any mention of Magneto’s background, as the future that he and the other heroes fight to prevent is one in which mutants—along with almost everyone else—are subjected to a new kind of holocaust. But there is an obvious bit of relativism at work in this film in that the leader of the anti-mutant crusade is played by Peter Dinklage, a New Jersey native perhaps best known for his work as Tyrion Lannister in Game of Thrones. Although no mention is made of his dwarfism, the clear implication is that even those subject to persecution are not immune from persecuting others. Embedding is disabled, so we can't include this other video here, but you can watch X-Men Opening Scene (2000) - Magneto in Auschwitz extermination camp over on YouTube, just click away, but be sure to come back here after you're done. Spider-Man is Stan Lee’s most memorable creation, and has been commonly described as Woody Allen with webs, a superhero who is a bit of a schlimazel, plagued with personal problems, perhaps even a bit neurotic, or, in the parlance of the ‘60s, full of hang-ups. Much like Captain America, Spider-Man is described as “puny” before his transformation, in this case due to an accidental bite by a radioactive spider. While meek and mild, he is a highly intelligent and diligent high school student, living with over-protective parents (actually his aunt and uncle), a type familiar enough in postwar Jewish communities like the Forest Hills section of Queens, where the story of Spider-Man begins. 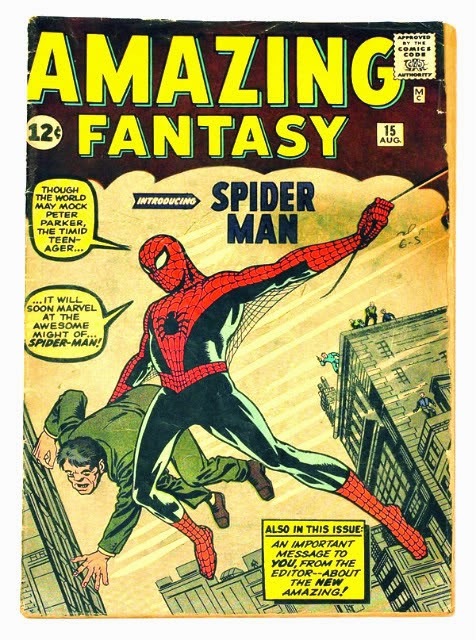 Although he is given an Anglo-Saxon name, Peter Parker, and a matching identity, the Jewish sensibility of Marvel’s most popular hero also extends to his constant use of humor even while fighting a supervillain. But what drives Spider-Man above all else is a very Jewish sense of guilt. This is worked into his origin. He does not immediately dedicate himself to helping others after gaining his extraordinary gifts. It is only after standing idly by during a robbery that he is shocked to learn that the criminal he allowed to escape went on to murder his Uncle Ben. 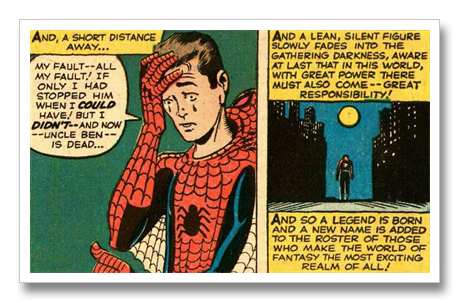 Stan Lee’s most memorable quote, “with great power comes great responsibility,” comes via this character, who serves as a father figure for Peter. The Amazing Spider-Man 2 (actually the fifth Spider-Man film, although the sequel to the 2012 series reboot) continues to emphasize the themes of guilt and responsibility as they relate to Peter’s girlfriend Gwen Stacy (another source of tragedy and guilt). The guilt for what you don’t do, for standing idly by while others suffer, for not taking a stand against discrimination and injustice, for not opposing the evil that we find in the world, for not being the best that we can be and for not taking responsibility for ourselves and for others, is the underlying message of the Marvel Age, in comics and now in motion pictures. It serves as a kind of pop culture midrash for our times. The Marvel Age of Midrash, that does sound like something Stan Lee might have written, and maybe Jack Kirby too. They did have a taste for alliteration, which maybe had something to do with ancient and medieval Hebrew's use of poetic devices of assonance and parallel structure. It's fair to say that Stan Lee, now 91 years old, and Jack Kirby (1917-1994) are the real marvels behind the movies of this past spring. So to Stan Lee, and to the memory of Jack Kirby, we say a hearty, mazel tov! This week's Torah portion or parsha is called Matot, a Hebrew word that we translate as tribes. The parsha begins with, "And Moses spoke to the heads of the tribes of the children of Israel" (Numbers 30:2). And we understand that some 3,000 years ago, there were a group of tribes that collectively were known as the Hebrews and the Israelites, and later became known as the Jewish people. And some three millennia later, here in America, we sometimes refer to ourselves, to the Jewish people as the tribe, and to ourselves as members of the tribe. And there's a touch of Jewish humor, and more than a little irony, in calling ourselves the tribe. After all, we are citizens in a democracy; we make our homes in cities and suburbs; we go to school and get high school, undergraduate, and graduate degrees; we work in businesses and professions; and we are surrounded by gadgets and gizmos and all sorts of advanced technology. And we are comfortable and more or less happy to be living in the modern world. Sure, civilization has its discontents, as Sigmund Freud put it, but we generally don't wax nostalgic about being nomads. We don't long for a return to living in tents out in the wilderness, hunting and gathering just to survive. We don't romanticize the tribal way of life of our ancestors, certainly not along the same lines that the 17th century English playwright John Dryden introduced the concept of the noble savage, a stereotype famously invoked by the 18th century French philosopher, Jean-Jacques Rousseau. Moreover, for us as Americans, the word tribe is most closely associated with the people encountered by Christopher Columbus and the Europeans who followed him in exploring and inhabiting the western hemisphere. For those of us of a certain age, the indigenous peoples of the New World were known collectively as Indians, and we also learned that they could be broken down into separate Indian tribes, the Navajo, the Apache, the Cherokee, the Comanche, the Hopi, and the list goes on to include some 566 tribes recognized by the United States government, which still officially uses the name Indian, as in the Bureau of Indian Affairs. Although the noble savage stereotype was established early in the history of European colonization of the New World, and invoked in our stories about Pocahontas, and how the Pilgrims at Plymouth Rock celebrated the first Thanksgiving, Europeans also have a long history of oppression and persecution of these indigenous peoples, beginning with the abusive treatment by Christopher Columbus as governor of the island of Hispaniola, continuing with the Spanish and Portuguese conquistadors, with the French, Dutch, and English settlers in North America, and with the western expansion of the American republic. I think we all know about the broken treaties and the confinement of native populations to Indian reservations. And we also know about how the old, traditional western genre in literature, film, and broadcasting worked, where the cowboys were always the good guys, and the Indians the bad guys. And as the bad guys, the Indians would always lose. And I think we are all aware of the racism they were subjected to as well, and the fact that somehow, despite all the progress we made in regard to Civil Rights, we still have a football team named the Washington Redskins. But our attitudes have changed dramatically over the past half century, and this is reflected in the fact that, outside of our government and the National Football League, we prefer the phrase Native Americans today, and associate it with more progressive attitudes towards a minority group that constitutes about 2% of the total US population, about 5.2 million people according to the latest census. This is pretty close to the percentage of the US population that is Jewish, a little less than the total number who identify themselves as ethnically Jewish, a little more than those of us who identify ourselves as Jewish by religion. But our sense of connection is about more than numbers, or the use of the word tribe, or even the fact that the first Europeans to encounter Native American peoples thought they might be lost tribes of Israelites, which was an idea that figured prominently in the Mormon religion. Our sense of connection also has much to do with our long tradition of social justice, and our great sympathy, and empathy, for oppressed peoples wherever we encounter them. That is why the Jewish involvement in the civil rights movement in America extended to the fight for justice for Native Americans. Congress passed the Indian Civil Rights Act in 1968, but civil rights for Native Americans is a more complicated issue than it has been for other minority groups. From the very founding of the American republic, our government has negotiated treaties with Native American tribes, and therefore has recognized those tribes, as sovereign entities. Tribal sovereignty is limited, but it does mean that Native Americans can be dual citizens of the United States and of what our government refers to as domestic dependent nations. It is not all that common to refer to the tribes as nations here in the United States, but across the border in Canada, Native Americans are now commonly called First Nations. And more generally elsewhere, the word nation has been used in place of tribe more and more often in recent decades. That's because the word tribe has some negative connotations, associated with the savage, the primitive, the archaic, while nation confers a much greater degree of respect and legitimacy on a group of people. But what, then, is a tribe? In one sense, a tribe is an extension of a family, and the term is synonymous with clan, although sometimes tribes are seen as composed of several different clans. But we see the idea of kinship clearly in our tradition, in the line of descent from Abraham to Isaac to Jacob, and from Jacob, who is also given the name Israel, to his twelve sons who become the ancestors of the twelve tribes of Israel. The complicated kinship structure also includes Abraham's first born, Ishmael, who also has twelve sons, who in turn become the ancestors of twelve Arabian tribes. And Isaac's first born, Esau, has five sons, and through them becomes the ancestor of other tribes, including the Edomites, and the Amalekites. You may recall that the Book of Esther includes a very prominent Amalekite by the name of Haman. So tribal identity is associated with the traditional idea of blood as a metaphor for kinship, but there is the connection formed through marriage, which is highlighted in the Book of Ruth, and the broader idea of a household. But the main point is that tribe is an extension of the idea of kinship, so if we are members of the tribe, we all related, all members of the same extended family. So what, then, is a nation? The root meaning from the Latin has to do with birth, the same root as native, and nativity, and it is synonymous with breed, stock, kind, species, race of people, and… tribe. The traditional notion of a nation, then, is a group of people with shared ancestry, with a common ancestor, people related to one another through an extended form of kinship, sharing the same blood, part of the same family. So the word nation can refer to a tribe. Or it can refer to a collection of tribes, such as the twelve tribes of Israel, or the Achaeans of Greece who fought the Trojan War, or the Iroquois confederacy that formed in this region during the 17th and 18th centuries, not to mention the Mayans, Incans, and Aztecs of Mesoamerica. The point is that a nation is not defined by its government, but by its people. The same nation can change governments many times; for example, France has been a kingdom, a constitutional monarchy, a republic, an empire, and a dictatorship. The great scholar of Judaism, Jacob Neusner, has stated that, from the time of the Roman destruction of Jerusalem in the year 70 of the common era, and the final defeat of the Jewish rebellion in the year 135, we became a nation in exile, and remained so until the founding of the State of Israel in 1948. The words tribe and nation have different connotations, but quite a bit of common ground, along with the traditional use of the word race, used to refer to a race of people, or what we otherwise would refer to as an ethnic group. This is the sense in which Nazi ideology was based on racial theories that claimed superiority for what they termed the Aryan race, viewing Jews and Gypsies as inferior races and therefore the target of ethnic cleansing, and the Slavic race as lower than the Aryans but good enough to be their servants. But whether we speak of race in this sense of the word, or ethnic group, or nation or nationality, or tribe, what we are essentially referring to is a people. That's what we do when we say, am yisrael chai, the people of Israel live. And when we speak of a people, we mean something more than a population, more than numbers. This week's Torah portion comes from what is commonly known as the Book of Numbers, and last week's portion included a census of the 12 tribes, but the Hebrew name for the book is Bamidbar, which means, In the Desert, and it is in the desert that the Jewish nation is born. Because when we speak of a people, we mean a population that shares a sense of group identity, that feels a sense of connection, of kinship, that shares a common culture, a distinctive way of life, and a distinctive way of looking at the world. But there are times when a people split up, divide into different groups, start to go their separate ways, and lose their shared identity. This is the problem that Moses faces towards the end of this week's Torah portion, as the Israelites prepare to take possession of the land of Canaan, with each tribe occupying its own designated region. The leaders of two of the tribes, Reuben and Gad, tell Moses that they want to settle on the east bank of the Jordan River, and not occupy the Promised Land. And Moses responds, "Shall your brothers go to war while you stay here?" It's a question some have raised in regards to the State of Israel today. And Moses goes on to say, "Why do you discourage the children of Israel from crossing over to the land which Adonai has given them?" The tribes of Reuben and Gad respond that they will send their men across the Jordan to support the other tribes, and will only return and settle down in the east bank after all the other tribes have taken possession of their lands. And this becomes an acceptable compromise. Moses uses the fear of God to keep Reuben and Gad from splitting off from the other tribes, but I think it is worth asking, what was it that held the Israelite tribes together? After all, the tribes descended from the sons of Abraham, from Isaac and Ishmael, became estranged from one another, and became, on many occasions, enemies. The same is true of the tribes descended from the sons of Isaac, from Jacob and Esau. So why didn't the same thing happen to the tribes descended from the sons of Jacob? We can point to the shared experience of being slaves in Egypt, of their subsequent liberation, and revelation at Sinai. That certainly ought to go a long way towards insuring a sense of solidarity. But what also was essential in binding the tribes of Israel together was the Torah itself, a sacred text that was given to all of them as a shared inheritance. It was understood as a message from Adonai that was addressed to every Israelite tribe. It gave them a set of laws, the first true system of codified law, that applied to every tribe, and unified them all under a single constitution. And it gave them the first true written history, a shared history of the Hebrew tribes, a relatively fixed history in the place of a set of myths and legends passed on by word of mouth, and constantly changing from generation to generation. And it was based on a system of writing, the aleph-bet, that made it possible for the tribes to communicate with one another more effectively than before, which kept them from drifting apart. The aleph-bet also made it possible for the tribes to keep records, and to organize themselves in increasingly more complex ways. And the aleph-bet was the basis of formal education, of schooling, of study, and of the ability to employ more abstract forms of thought than peoples who lacking in literacy. The result was not by any means a perfect union. The Torah, and the Tanach tell the story of a struggle to maintain a collective identity. In the Book of Judges the tribes are a loose confederation, and some but not all of them come together every so often under the leadership of a particular chieftain. Saul, the first king of Israel, is not all that different from the judges who preceded him, and when he assembles an army, the tribes of Reuben and Gad do not participate. It is King David who is finally able to unite the Israelite tribes into a unified kingdom. And to establish a capital that is independent of any one tribe, he conquers the city of Jerusalem, a city that was outside of any tribal region. The founders of the American republic followed this example in creating the District of Columbia where the city of Washington could be situated, so that our capital would not be located in any one of the states. David's son, King Solomon, built the Temple in Jerusalem to strengthen the union of tribes, but after he died, the kingdom split in two, with the southern kingdom of Judah, composed of that largest of the tribes, together with the small tribe of Benjamin, along with members of the tribes of Levi, the priestly tribe that had no land assigned to them. The rest of the tribes formed the northern kingdom of Israel, which was eventually destroyed by the Assyrians, with the members of those tribes either assimilating, or joining the southern kingdom, or joining with newer settlers in the north to become the Samaritans. The tribe of Benjamin was eventually absorbed into the tribe of Judah, leading to the notion of the ten lost tribes of Israel, the subject of centuries of searching on the part of Christians as well as Jews. And not long after the discovery of the New World, some thought that the ten lost tribes had been found, thinking that they were the Native Americans. Recently, there as been some evidence that remnants of some of the ten lost tribes did survive into the Roman era, but today we really are the tribe, that is, the tribe of Judah, which is why we call our religion Judaism, and call ourselves Jews, even those of us whose name indicates membership in the tribe of the Levites. But we are divided in others ways, between Ashkenazi, Sephardic, and Mizrahi Jews, between Israeli and Diaspora Jews, between Reform, Conservative, Reconstructionist, and Orthodox Jews, and so on. We commonly use the metaphor of branches in talking about Judaism, that our own Reform Judaism is one of the branches of Judaism, and this metaphor resonates with the Tree of Life, which was said to have existed in the Garden of Eden, and which also serves as a metaphor for the Torah, for the sacred text that binds us together as one people. In one rabbi's discussion of Parsha Matot, he notes that there is another word that is used in the Torah that like matot also means tribes: shevatim, which means branches. Matot, on the other hand, means sticks, and its appearance in this week's Torah portion suggests that the Israelite tribes have become less connected to one another than they previously had been. The Lubavitcher rebbe expresses a beautifully spiritual sentiment in suggesting, "Every stick yearns to return to its tree, yearns for the day that it will once again be a fresh, vital branch, united with its siblings and nourished by its progenitor." But, of course, we know that unless we go to great effort to preserve the severed limb, sticks that are cut off will tend to scatter, and grow further and further apart. And that is what happens to families, to tribes, to peoples as they separate. Unless they have something to hold them together. Something like our long tradition of literacy and learning. Parsha Matot also includes an account of the Israelites taking revenge against the Midianites, in response to an earlier attempt by the Midianites to destroy the Israelites. The Midianites were also said to be the descendents of Abraham, and often at odds with the Israelite tribes, although Zipporah, the wife of Moses was a Midianite, and her father Jethro was a priest of Midian. The passage serves as a reminder of the realities of tribal life, of the conflicts, the violence, and the brutality. There is nothing noble about tribal savagery, and the Israelite tribes were not immune to it. And what this Torah portion relates are the realities of tribal warfare. But what the Torah also conveys is the fact that, just as the long journey of return from slavery in Egypt to settlement in the Promised Land was about to come to end, the Israelite tribes were just beginning a much longer and more difficult journey, from tribalism to civilization. The tribes of the children of Israel, our ancestors, were pioneers in that uncharted territory, as they forged a new way of life based on the rule of law, human rights, and ethical principles, and on education and learning based on alphabetic literacy. Our Holy Scriptures tells the story of our difficult struggle to banish tribalism, and not by having some other, deeply flawed form of civilization imposed on us by others, not by the Egyptians, or Babylonians, or the Greeks or the Romans. When it's imposed from the outside, it is all to easy to revert to tribalism once that outside force is gone. Freud called it the return of the repressed, and we can see it happening all over the world today. No, what the Israelite tribes did was to pull themselves up by their own bootstraps, find their own way to a civilized way of life. And in doing so, they insured the survival of the Jewish people as a nation in exile. No one knows how many tribes have vanished over the course of human history, how many tribal languages and cultures have disappeared with out a trace, and continue to do so to this day. But as the people of the book, we have survived against all odds. Over the past two millennia, we have survived new forms of tribalism that came in the name of religious zealotry, and we survived the modern form of tribalism born of Nazi and fascist ideologies in the 20th century. And we continue to find ourselves struggling against the force of tribalism today. It is an external struggle, as current events make all too clear, but it is also an internal struggle, to maintain our collective identity, to continue to survive as the tribe, and as a civilization committed to higher ideals. I can think of no better way to conclude than with the words of the prophet Isaiah (49:6): "It is too light a thing that you should be My servant to raise up the tribes of Jacob, and to restore the offspring of Israel; I will also give you to be a light unto the nations, that My salvation may be unto the ends of the earth." Please join us at Shabbat services tonight, July 18th, at 7:30 PM, as we welcome our new Cantor and Religious School Director, Sandy Horowitz. Cantor Sandy Horowitz brings to Congregation Adas Emuno a passion for both music and Jewish education. She was raised in a secular Jewish foreign service family and lived abroad during most of her childhood. 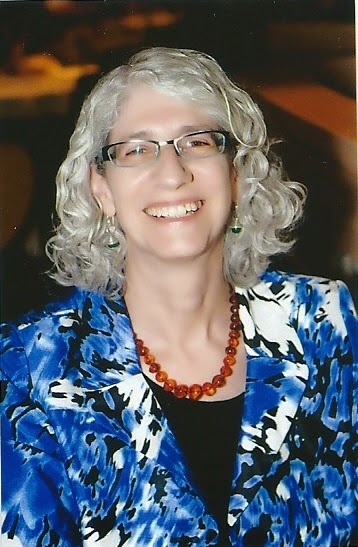 After receiving her BA in English Literature/Composition from Colgate University, Cantor Horowitz moved to New York City and began formal voice training, while working in publishing and then as a computer systems project manager. She is also a NY State licensed massage therapist. Meanwhile, she began exploring her Jewish roots–and immediately found a connection through music. She served as a cantorial lay leader, became a b’nei mitzvah tutor, and was a founding member of the Hebrew School of Beth Am the Peoples Temple and Hebrew Tabernacle of Washington Heights, where she was actively involved in curriculum development and policy planning. She eventually enrolled at the Academy for Jewish Religion, and was ordained in May 2014, along with receiving a Masters in Jewish Studies from Gratz College. During this time she twice received the Rabbi Timoner Award for her musical compositions. She served as cantorial intern at Temple Beth Shalom in Hastings-on-Hudson (and was a religious school teacher there for several years), and as the Cantor of Temple Beth Sholom in Flushing NY. As a classically trained singer and lover of classic rock and folk music, Cantor Horowitz is equally comfortable with the great masters of Jewish hazzanut and contemporary participatory repertoire. Cantor Horowitz is married to Marty Morell, an international development specialist and avid musicologist; their daughter Sara currently attends Swarthmore College. is now enrolling for Fall 2014! One of the newest additions to our marvelous little garden is a peace pole, with a prayer for peace written in Hebrew, English, Spanish, and French. On the English side, the words read, "May Peace Prevail on Earth," a message central to our faith, and a prayer that for all of humanity. If you haven't yet been to visit the Adas Emuno garden, located on the far side of our religious school building, well, what are you waiting for? Our next session of Poetry in the Garden will take place on Sunday evening, July 20th, at 7 PM. You can come just to listen, or to take turns reading poems. Bring your favorite works by Jewish poets, your own original poems, or any other poems you would like to read. In the event of inclement weather, we will meet in the religious school building. Poetry in the Garden is free and open to the public. The recent Pew Research Report found that an astounding one third of all U.S. Jews under the age of 30 call themselves Jews of no religion. If that seems problematic to us today, the very thought that one could be Jewish without Judaism was inconceivable to our ancestors. All that changed on July 27, 1656, the day the leaders of Talmud Torah, the Portuguese Jewish Community of Amsterdam, excommunicated 24-year-old philosopher Baruch Spinoza (1632–1677). Although the writ of excommunication did not specify Spinoza’s “abominable heresies,” we know from his later published works that he denied almost every major tenet of traditional Jewish belief, including that God created and controls the world, that God makes ethical demands on us, that the Torah is the revelation of God’s will, and that Jews are God’s chosen people. He also dared to criticize religion—all religion—for propagating untruths and fostering dogma and superstitions that had led to great evils perpetrated in the name of God. While Spinoza’s excommunication isolated him from his family and friends, it did not cause him to repent or his ideas to wither. Rather, he went on to publish his magnum opus, Tractatus Theologico-Politicus (1670), as well as Ethics (1675), earning him the reputation of being the most brilliant and controversial philosopher of his age. Even though he never again had contact with the Jewish community, Spinoza did not renounce his Jewishness. He declined all overtures to convert to Christianity and continued to study traditional Jewish thought—if only to refute it. His home library was full of Jewish books. He studied Hebrew in order to be able to read the Torah in the original language, and was said to be working on a book of Hebrew grammar at the time of his death. In short, in being the first great Jewish philosopher to adopt an ideology of pure reason, to the utter exclusion of revelation, Spinoza also became the archetype of the secular Jew. And, as a secular Jew, he offered ideas that have profoundly impacted Jewish thought and belief ever since. Spinoza’s influence would extend to the Zionist enterprise as well. Spinoza also taught that “the true aim of government is liberty.” He asserted: “The ultimate aim of government is not to rule, or restrain by fear, nor to exact obedience, but to free every man from fear so that he may live in all possible security…” (“That in a Free State Every Man May Think What He Likes, and Say What He Thinks”). The Zionist love affair with Spinoza was in full evidence in late 1953, five years after Israel’s birth and three years in advance of the 300th anniversary of the philosopher’s excommunication, when Israel’s first Prime Minister David Ben-Gurion published “Let Us Amend the Injustice” in the Hebrew daily Davar. Calling Spinoza “the deepest, most original thinker to emerge [from our people] from the end of the Bible to the birth of Einstein,” he urged Hebrew University to publish Spinoza’s collected works in Hebrew. He also queried the chief rabbis as to whether Spinoza’s banishment still applied, saying that the free citizens of modern Israel could no longer accept it. The widely read article was hotly debated, underscoring the gulf that had emerged between the secular and religious factions in Israel. In many ways all of us are “Spinoza’s children,” for Spinoza’s ideas changed the Jewish worldview. Even though he himself was anti-religious, he helped lay the groundwork for a modern Judaism that integrates reason with faith and honors freedom of thought and practice. He inspired the notion of a secular Jewish identity and championed democratic ideals that played a role in the Zionists’ conception of the fledgling Jewish state. 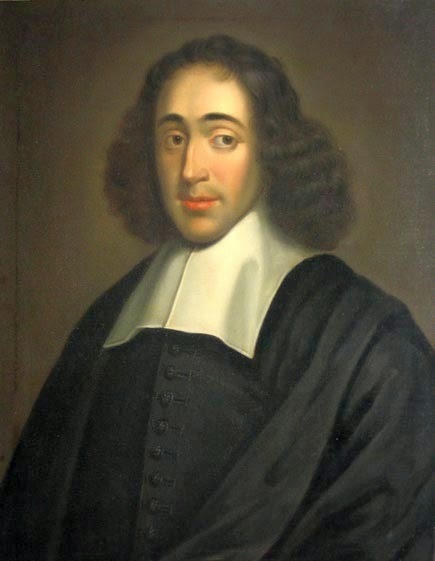 In his day Spinoza was cast out of the Jewish community for his dissenting views on religion. Today, with one of three Jews under 30 calling themselves Jews of no religion, we marginalize secular Jews at our own peril. Interested in reading up on Spinoza? It can truly be said that Enlightenment begins with Spinoza!